SDS expanded and diversified into its marine division in 1984 when it first launched the tugboat “Dauby,” named after founding partner Frank Daubenspeck. 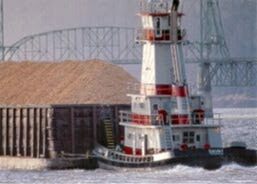 Before launching the “Dauby,” SDS hired outside contractors to haul its chips down river to pulp mills, today, with its expanded operations and ideal location on the Columbia River, SDS operates a fleet of tugs, providing towing services to outside companies. In addition to the Dauby, which remains our largest and most powerful tug, we own five other tugs: The “Mt. Adams”, the “Klickitat”, the “White Salmon”, the “Mt. Hood” , and the “Bruce M”, named in 2004 after SDS co-founder Bruce M. Stevenson. While the Bruce M and Dauby are great for pushing heavy loads, the smaller tugs are ideal for a wide variety of maritime uses. As the only company currently towing log rafts on the Columbia River, SDS is diversified in the forest products business beyond manufacturing. Many companies who own and cut timber within our area haul their logs to SDS in order to benefit from the economic and environmental advantages of towing or barging products as compared to truck hauling.